For many people, Christmas just isn’t the same without a charming Nativity scene. 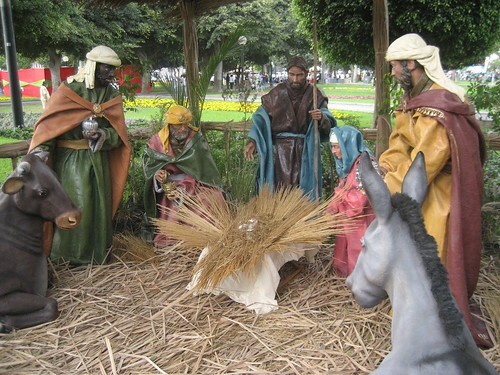 Life size Nativity sets can brighten up any front lawn. They also remind us of what Christmas is truly about—commemorating the birth of Jesus Christ. The Nativity scene is intended to remind us of the manger in which Christ was born. It typically includes a wooden stable, Mary, Joseph and baby Jesus, three kings, the shepherds and their animals and an angel. Nativity scenes are to be reminiscent of the miracle that took place a long time ago in Bethlehem, where Jesus was born and laid in a manger on Christmas day. Made of the most durable fiberglass, outdoor Nativity scenes are a special way to share holiday joy with family, friends and neighbors. So, regardless of which set you choose, don’t be surprised if your lawn becomes the neighborhood sensation. 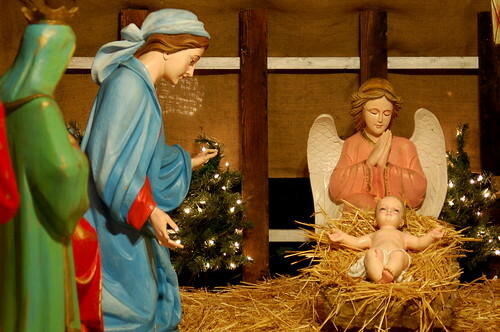 After all, who isn’t fascinated by the story of Christmas reproduced in life size figurines? 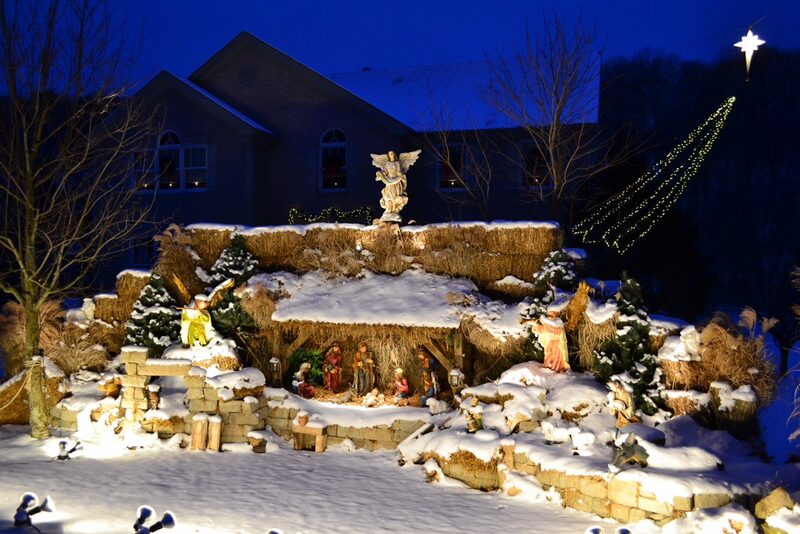 All about location – Making your nativity scene appear larger than normal depends a lot on the location. Find an area that best fits all of your characters without squishing them too closely together. Begin by placing the stable in the middle with the characters scattered equally around it. Next, consider your surroundings. Place your Nativity scene around one lone tree or as beautiful runway leading to your front door. Proper lighting – When selecting the lighting for your nativity scene try to use large flashlights with square handles—they are easier to work with. Place the lights so that baby Jesus, Mary and Joseph are the focus of the scene. For a more dramatic look, use an outdoor floodlight or spotlight to illuminate the display more profoundly. This will help to expand the radius of your Nativity scene. Embellish the scenery – Give your Nativity set life by placing real poinsettias or potted winter plants around the stable and characters. For a more natural look, include pinecones and hay as décor. To create a divine appearance, place the angel on a crate or oversized box draped in fabric. The extra height will give the Nativity scene an embellished appearance. Add a touch of nostalgia – For a whimsical touch, hang strands of twinkle lights at the back of the display. This lighting affect will emphasize the scene’s overall beauty, giving it a magical ambience. You can also place another square handled flashlight below baby Jesus to illuminate his crib, emphasizing the miracle of Christmas. Outdoor Nativity sets make great lawn arrangements for the holiday season. They help to better illustrate the story of the night that Jesus came to earth in order to create an eternal life for all mankind. By following these simple tips, your Nativity scene will not only be larger-than-life, but also the best decoration in the whole neighborhood. 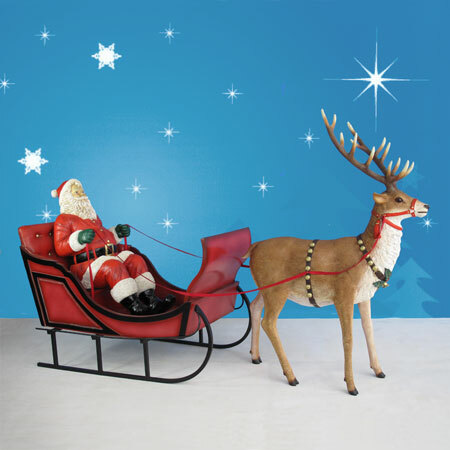 Originally Santa’s Sleigh had eight reindeer – Dasher, Dancer, Prancer, Vixen, Comet Cupid, Donner and Blitzen. This was according to the 1823 poem by Clement C. Moore “a Visit from St. Nicholas” or “The Night before Christmas”. Then Rudolph (the red-nosed reindeer) was added. Rudolph comes from a story originally written by Robert L. May about a foggy Christmas Eve, when Santa lost his way and Rudolph helped find the way with his red lighted nose. There are so many good Children around the world today, that there is no way Santa and his nine Reindeer can reach them all on Christmas eve. So Santa Claus sent the elves to university to learn how to build aircraft. When the elves returned to the North Pole the first thing they did was build an amazing aircraft factory beside the Toy Factory. Here they developed a huge hypersonic jet, which they called Santajet X-12-25 which flies faster than the speed of sound. This jet can hold 500 reindeer, 55 Sleighs and Santas. And there’s provision for a extra deck in case there are more good children in further years who will want Santa to deliver them gifts on Christmas Eve. While the elves were building the Santajet X-12-25, Santa travelled around the world interviewing men to become junior Santas. He recruited 60 junior Santas. They spent several years training with Santa and now 55 of them are ready to become full-fledged Santas. Santa also started a reindeer breeding program. And now there is Dasher 1, Dasher 2, Dancer 1, Dancer 2 , Dancer 3 and so on – 500 reindeer in all to pull 55 sleds next Christmas. And all of this was happening while a team of Elves built 55 new Sleighs. Next Christmas there will be 55 Santa Sleigh teams travelling in the Santajet X-12-25. Each Santa Sleigh and Reindeer team will disembark the Santajet in a different part of the world and deliver gifts to all of the children, who have been good, in that region on Christmas Eve. So be prepared, Children, for a modern Santa delivery process. You will have to send your Christmas toy list to a special email address at the North Pole. All children who are good this year will receive the email address via email to theirs or their family’s computer. If you’re a kid without a computer in your family you can go to the library and use a computer there. If you’ve been a naughty kid, it may not be too late to be good – but you’ll have to work very had at it. Note: This is fiction, everything in this story is from the imagination of our writers and not to be taken literally. It is not meant to change anything about all the Santa Sleigh and Reindeer stories that came before our story. Visit our store to shop a wide variety of nativity sets, outdoor nativity sets and other fine outdoor Christmas decorations. Shop a wide selection of religious statues and other life size statues from our store inspired by the themes of Saint Francis.